A tiny post-holiday tale — a version of which originally appeared in the lovely SHOULDER FRIENDS journal, edited by Lila Seidman and Lillian Behrendt. Probably not suited to kids, but who knows? Maybe. It’s not “dirty” or anything. Death comes knocking at the front door. I open but say wait. I must first take in the packages that have been left on the doorstep, at the backdoor and I must also remove the packets and the parcels that are hanging on strings outside all the windows. Ok, says Death. And walks in. I show him what I got. Shoes for the banned Broadway show, perfume for that office party held by the ghouls at school, t-shirts and jewelry for the gallery openings my friends the artists wished they could have but don’t. Pearls and fresh flowers for the operas I never went to with my parents. Books for any time at all. Death looks at all the boxes as he sits on the sofa. I say Death, what can I give YOU? He says Nothing. I’m just glad to be able to put my feet up and rest. He puts his foot bones on the coffee table to demonstrate. So I tell Death his tarot. Death thinks this is pretty funny. He laughs at his reading because his own card, number 15, never turns up. We try a bunch of times. Basic 3 spread, basic 4, Celtic Cross. Nope. Not even the Hanged Man, which is kind of deathy. Haha! says Death. Such lively cards! 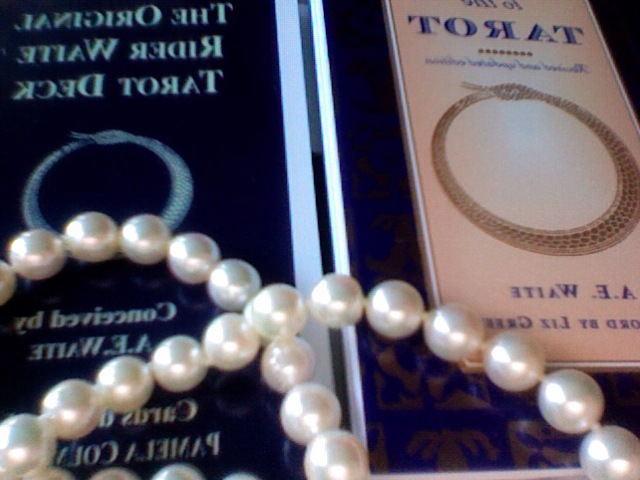 He tries on the pearls and prepares to sing a little aria from La Traviata. The doorbell rings and we swivel our skulls wondering, who or what is at the door this time.